If you have a pool or are planning to install one, consider adding a dedicated bathroom accessible to the pool area. 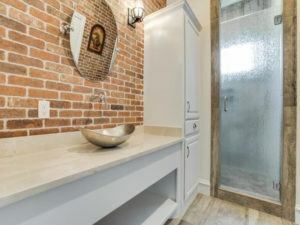 You want a bathroom that is both visually pleasing and functional. How will your pool bathroom design differ from the other bathrooms in your house? Here are a few thoughts. 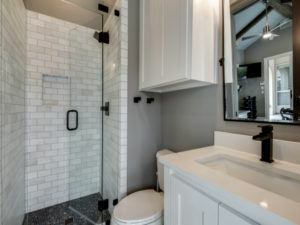 The pool bathroom is where family and guests alike can use the facilities and change their clothes—another reason it’s a good idea to have a dedicated bathroom at the pool since you don’t want dripping wet bodies parading through your house. Because people will be removing their wet clothing here, it’s a good idea to locate the pool bathroom next to the laundry area. It should be one quick step from the bathroom to the laundry. Bonus if the pool bathroom has a dedicated entrance from the outside! PHOTOS: For more inspiration from this exquisite outdoor space, view the project gallery. Storage is vital to any space in your home but even more so to your pool bathroom design. First and foremost, you want plenty of space for towels. Secondly, people will use this bathroom to change out of and back into street clothes. Provide baskets or cubbies for storing clothes so their clothes are right on hand when they are changing out of bathing suits. This is also a good place to keep toiletries such as soap, shampoo, a spare blow dryer, and makeup. Naturally, there is moisture in a bathroom. Because many users will be wet when entering this room, a floor drain is a good idea. 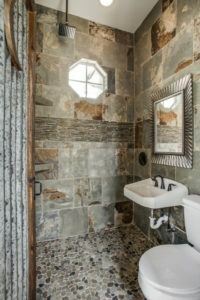 Obviously, tile and other waterproof materials should also rule the day in your pool bathroom design. Additionally, a window and bathroom fan will allow moisture to escape, preventing mold and mildew growth. Fixtures are an integral part of any bathroom. 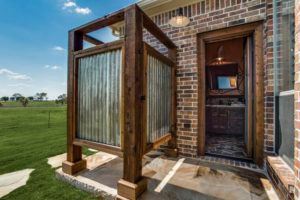 While you may opt for only a half-bath (toilet and sink) for your pool bathroom design, it might be nice to include a shower, too. That way guests can wash off the chlorine before changing back into street clothes. One accessory that every bath should have, especially a pool bath, is towel hooks to prevent towels from landing in an untidy heap. By giving users a place to hang towels, wet towels are discouraged from developing mildew or collecting dirt from the floor. Because a pool bathroom has a slightly different function than a regular bath, consider your needs carefully before making your pool bathroom design choices. With a little thought and planning, your pool bathroom can provide you with an attractive, functional addition to your home. Whether you want to add a pool bath or an entire outdoor living space, we can do the job. Take a look at our photo gallery and gather ideas.